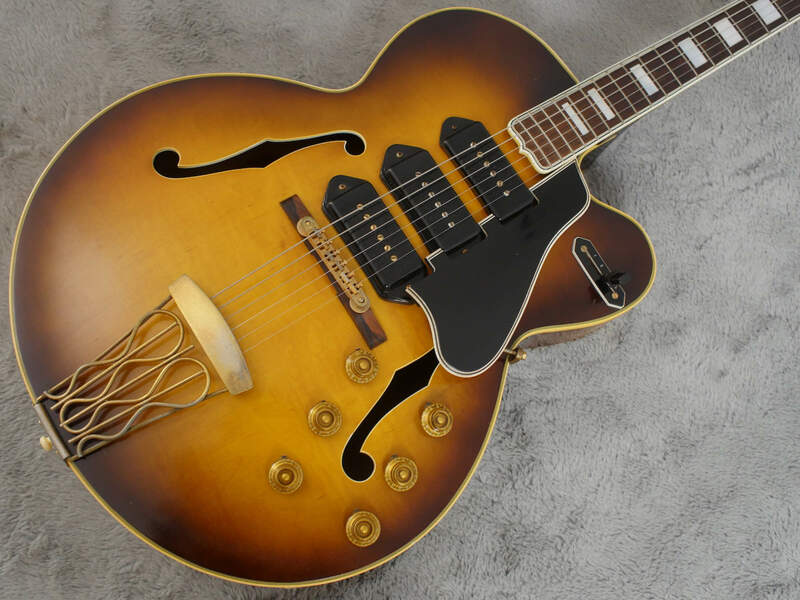 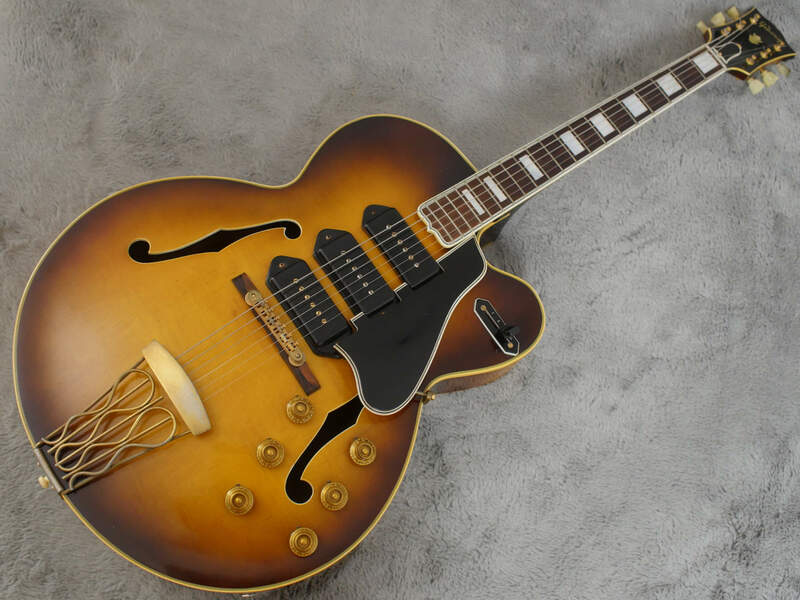 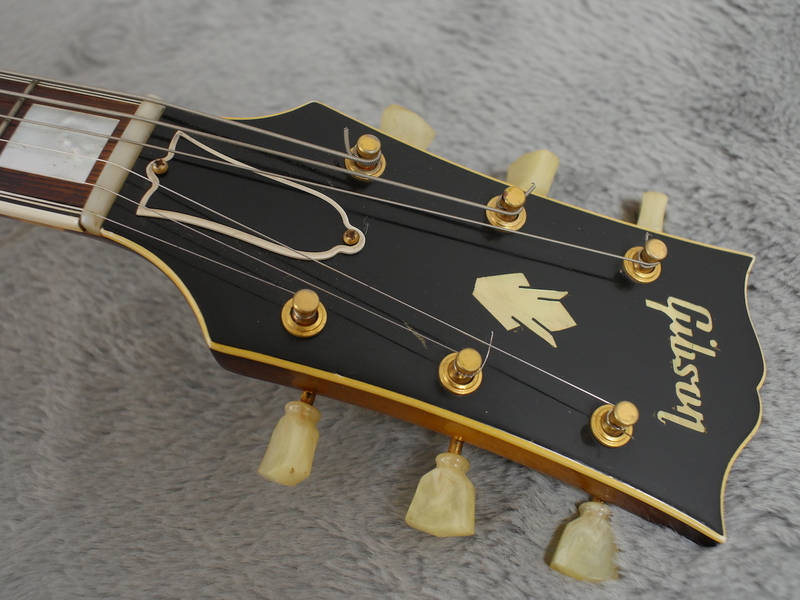 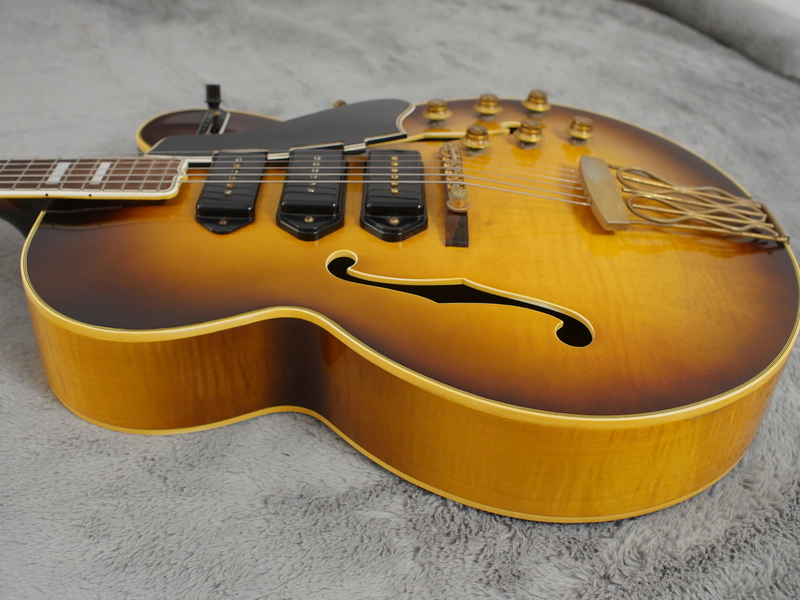 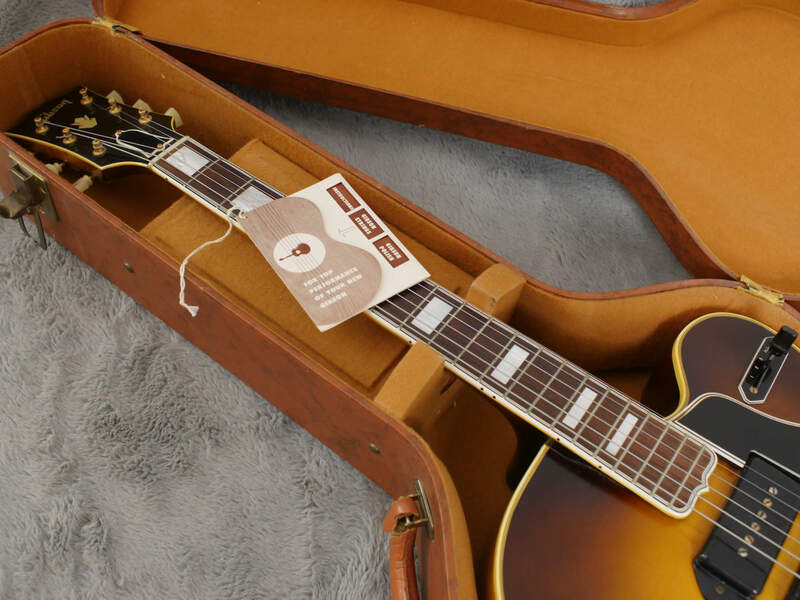 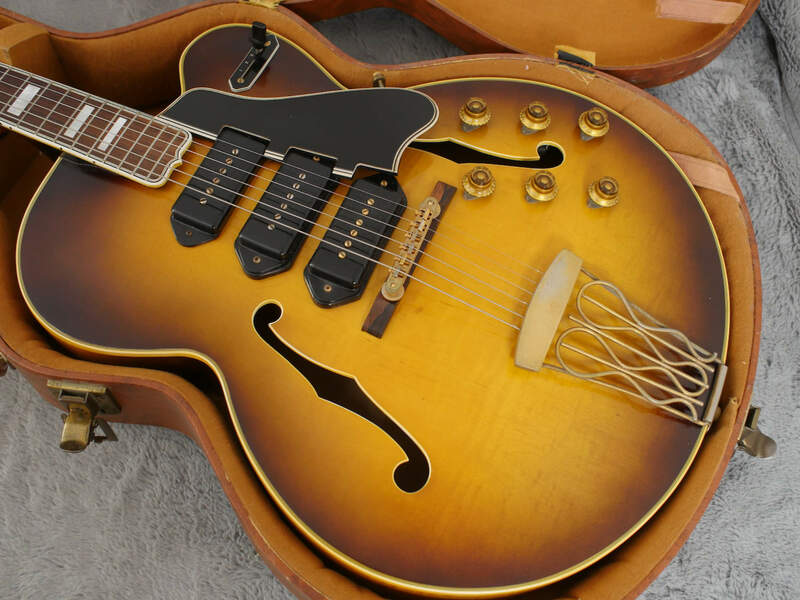 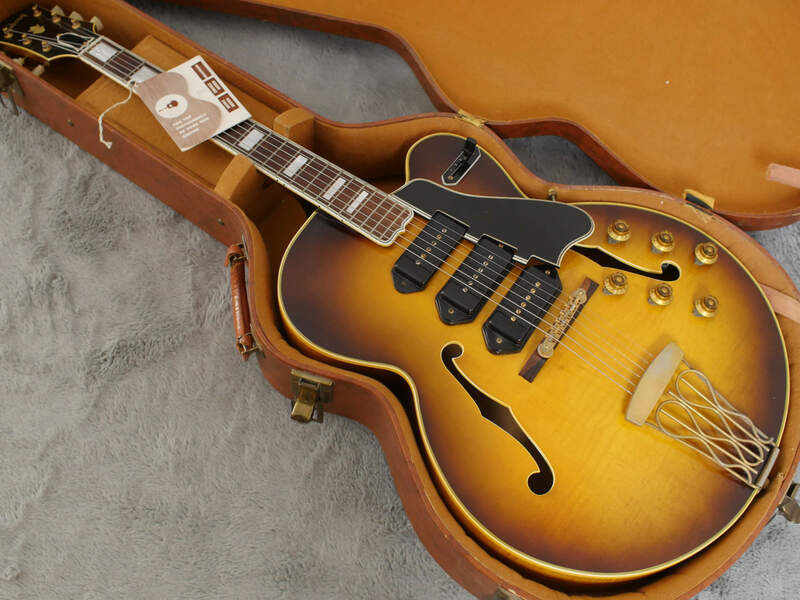 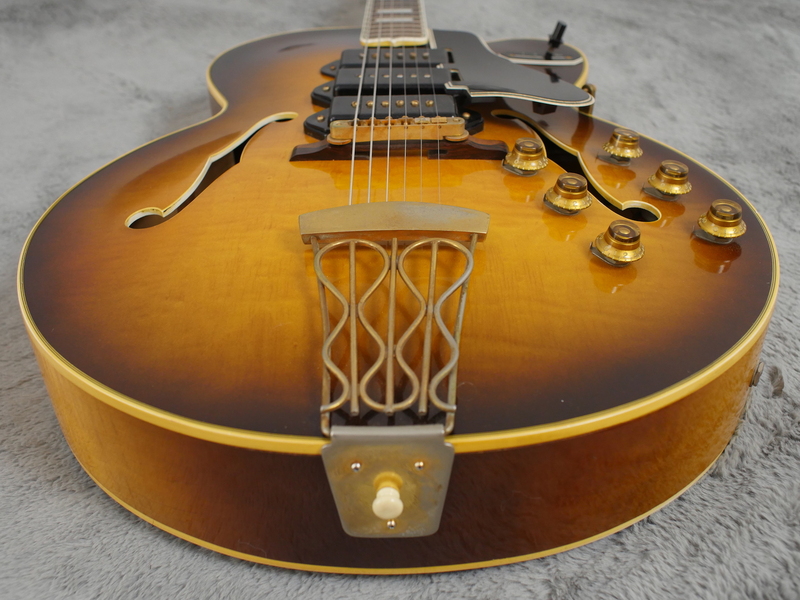 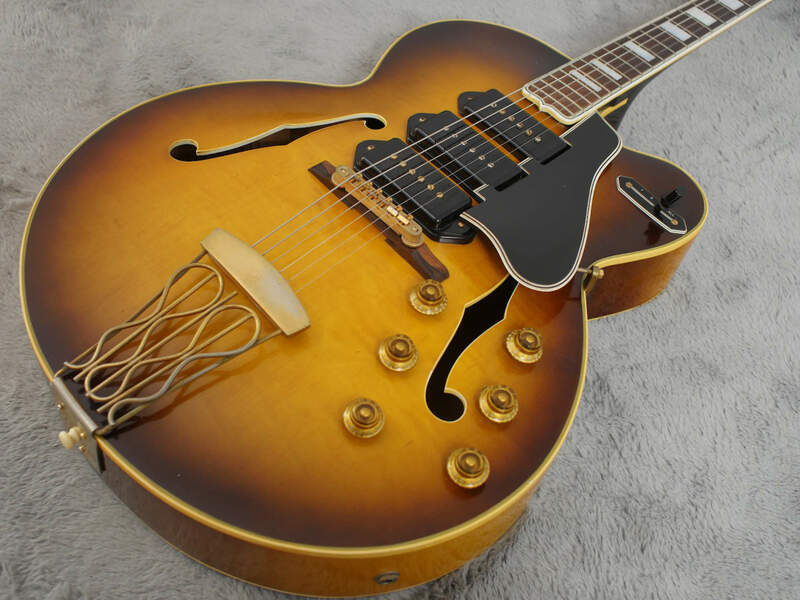 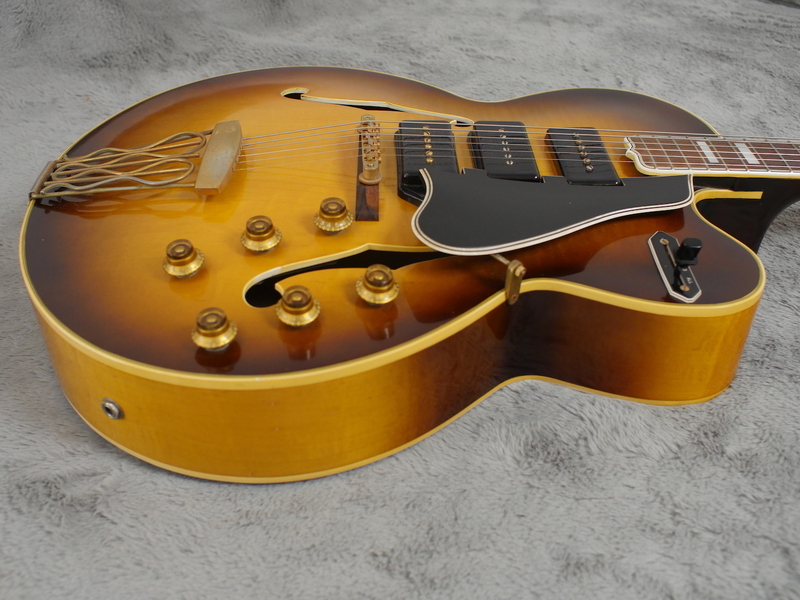 We cannot see a thing out of place on this very nice 1957 Gibson ES-5 Switchmaster which is in our favourite combination of 3 x vintage P-90’s and the 4 way switch that allows you to dial in an infinite variety of tones..
Beautiful, nicely faded tobacco sunburst finish has some mild flame on it, especially on the back and neck. 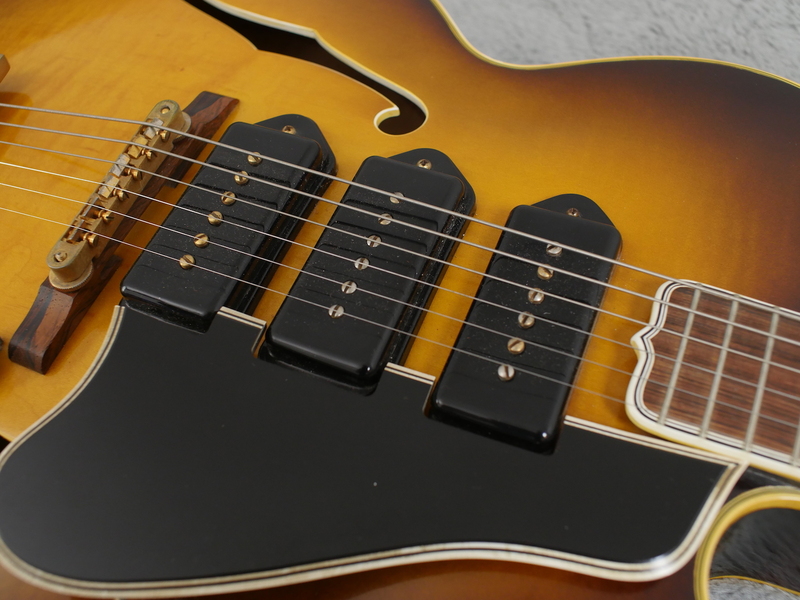 All three P-90’s are real strong and have vintage, classic P-90 tone in total abundance. 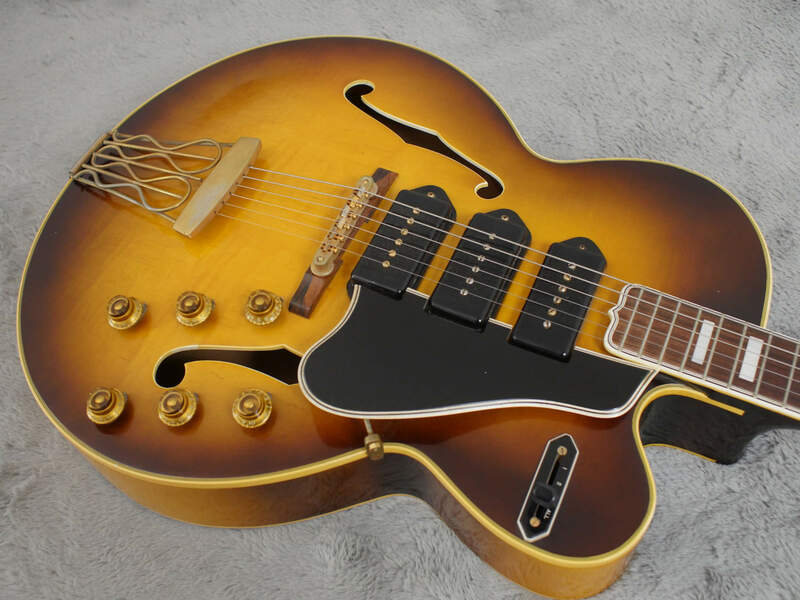 Basically, with the combination of a volume and tone control for each pickup and with the 4 way Tele type switch in ‘ALL’ position you can get any tone you like and mix it to your hearts content on the 6 knobs that adorn this lovely ES-5. 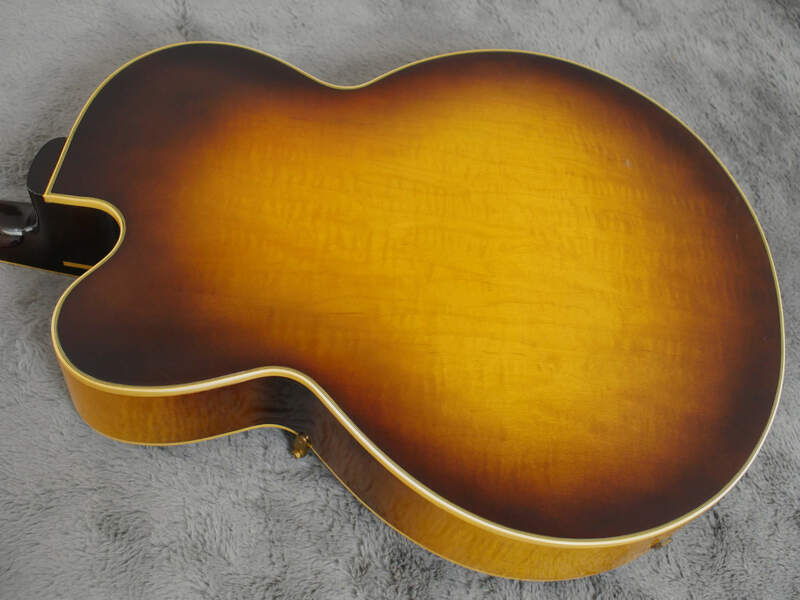 Big, chunky, 1957 neck is very comfortable to play and if you like big neck Gibsons, you will love this. 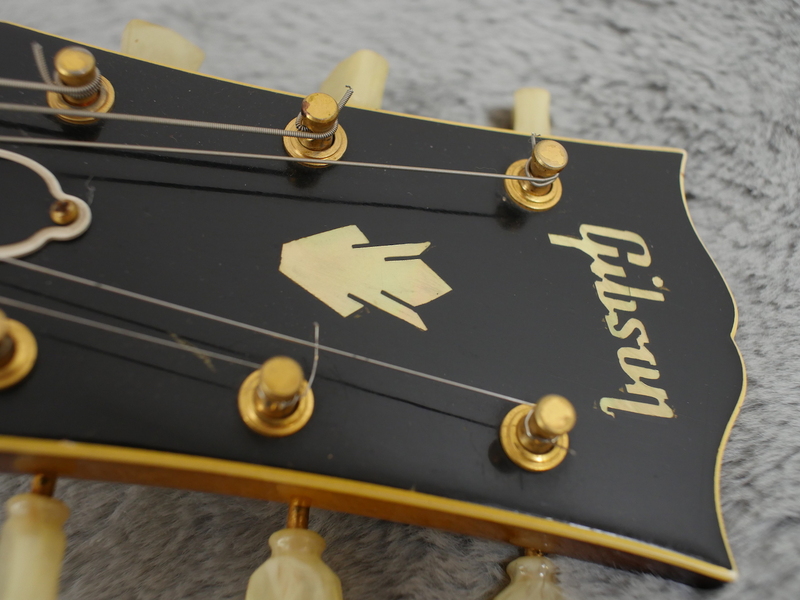 There are just a few wear spots here and there, including some spots on the back of the neck that you can see on the many pictures in the gallery. 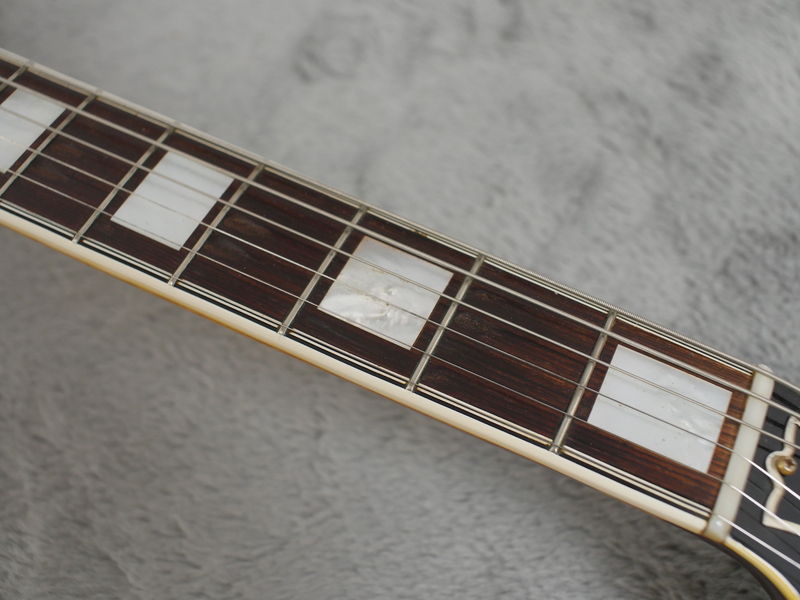 The pickguard has warped slightly upwards but is not getting in the way of normal use. 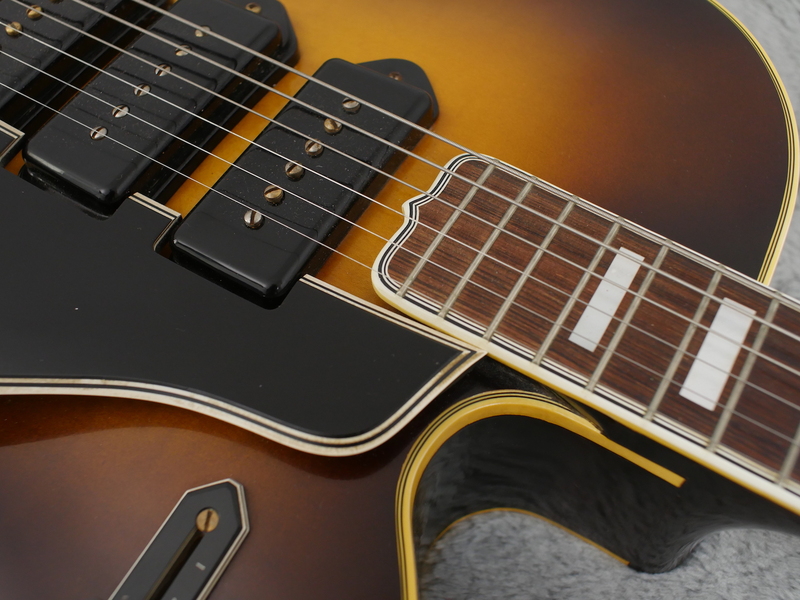 All hardware is correct and unlike a lot of ES-5’s you see, none of it has been raided by the parts monkeys. 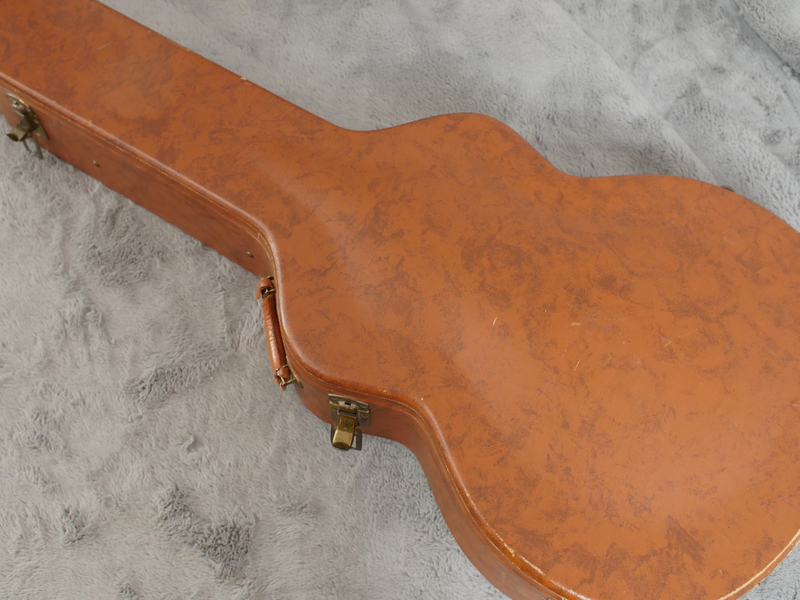 Case is a period correct brown lifton type with brown lining and like the guitar, is in excellent condition although the case lid stay has broken. 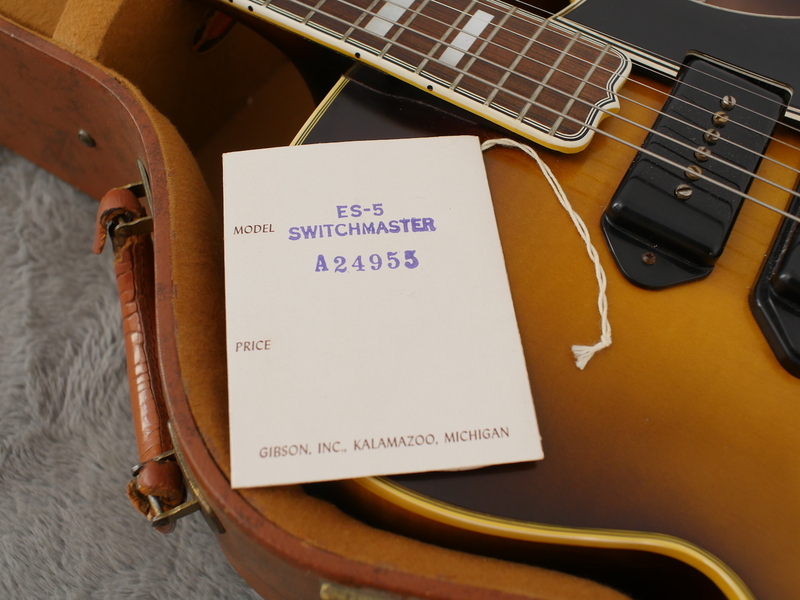 A nice touch is the original hang tag with the correct serial number on. 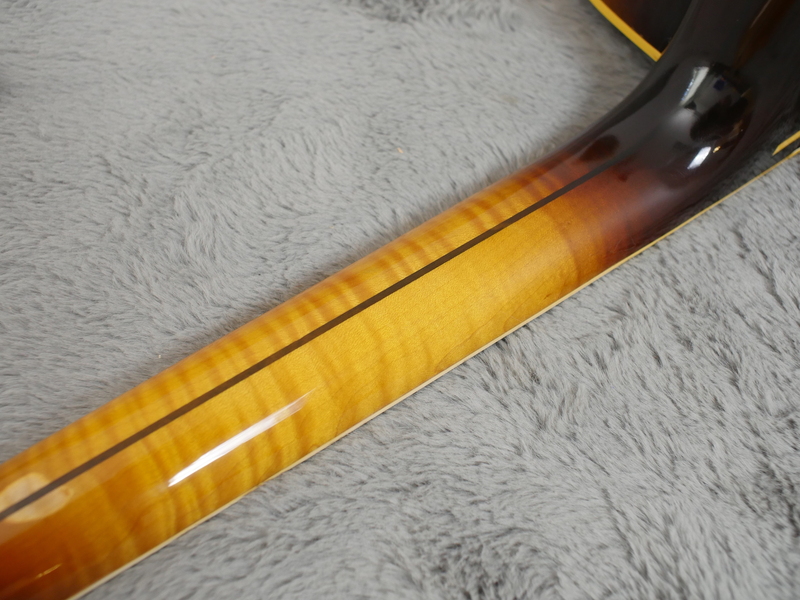 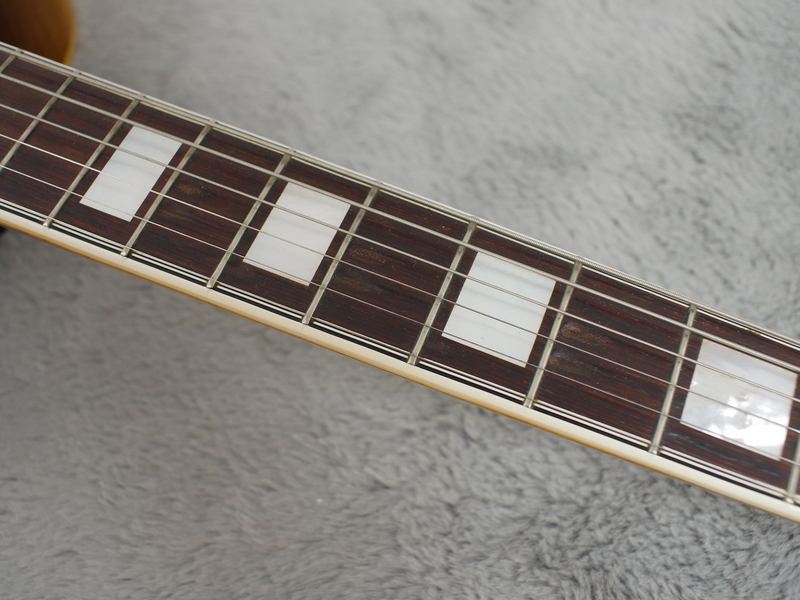 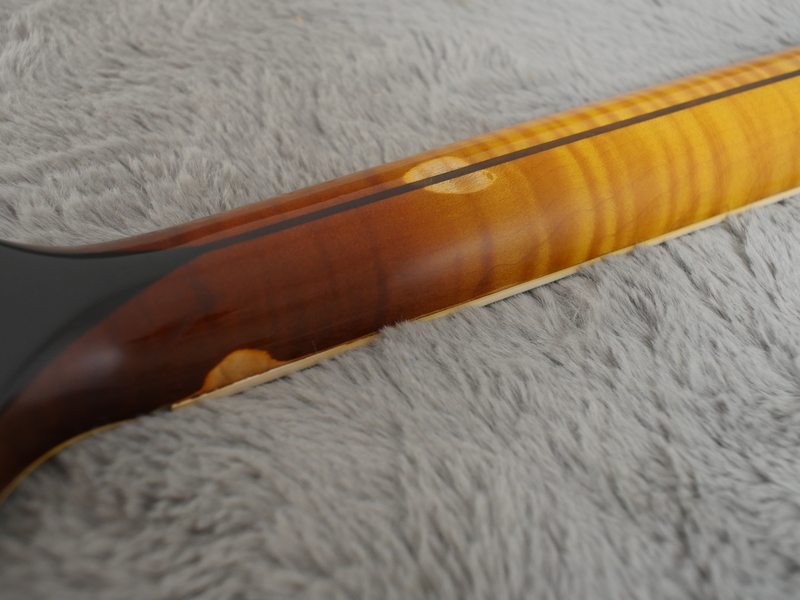 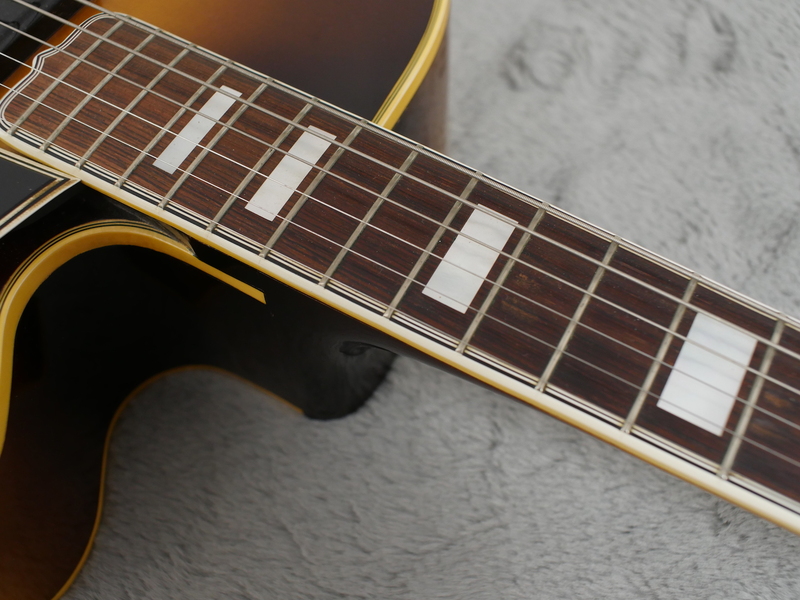 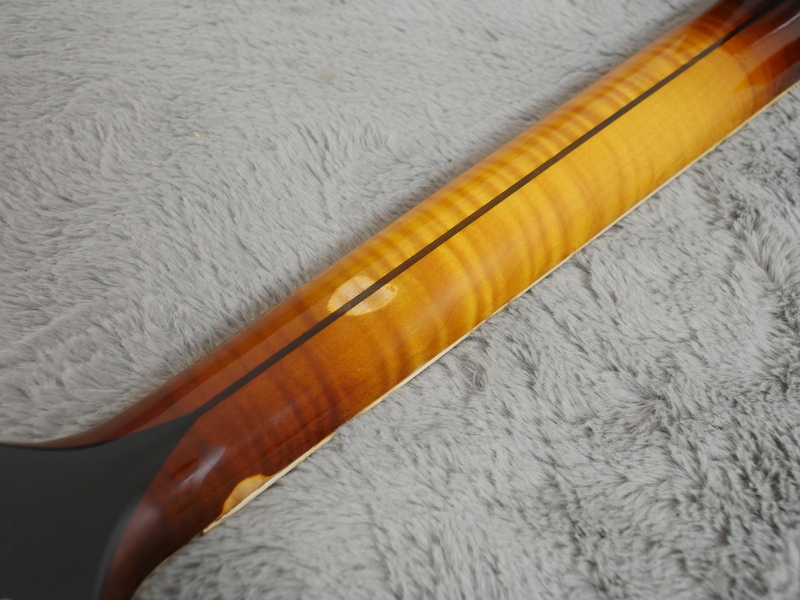 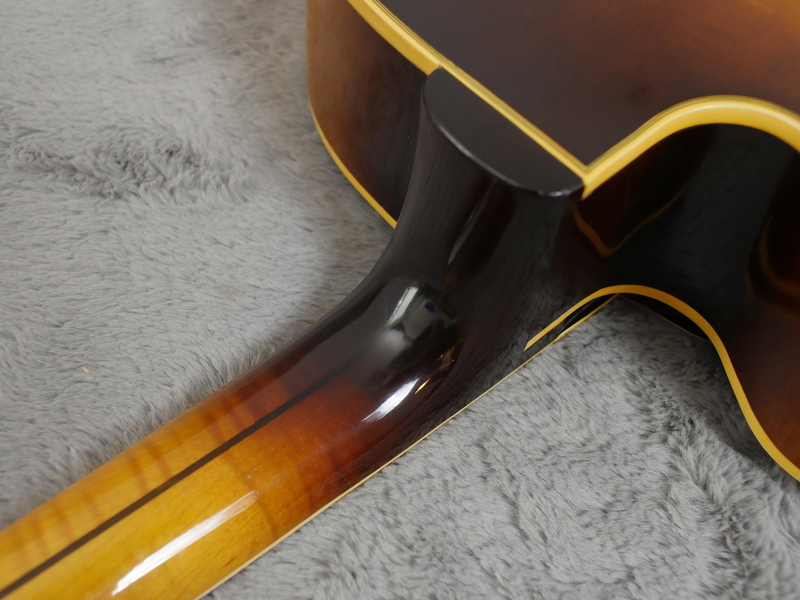 Original frets have very little wear no doubt aided and assisted by a lifetime of jazz type flat wounds being fitted and it has a nice, low action with good playability all across and up and down the fingerboard. 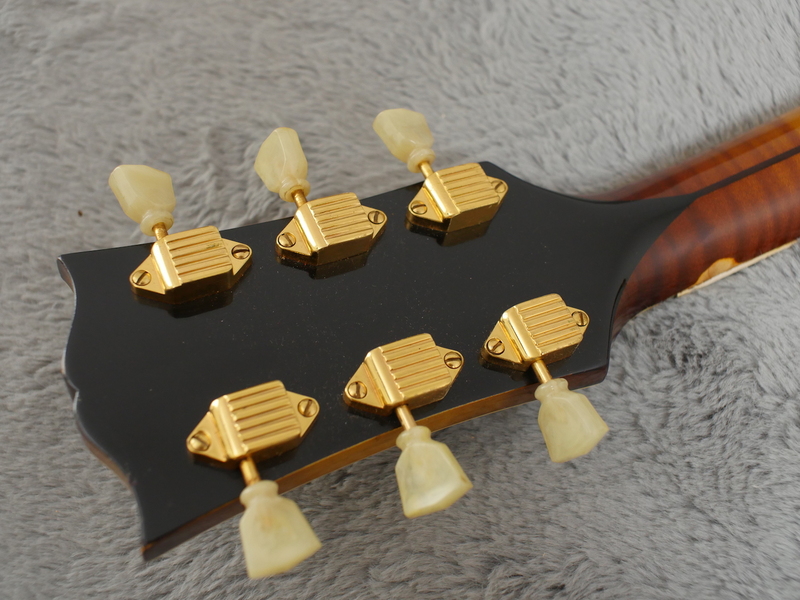 There is some rutting on the fingerboard but not too much.